Mohs micrographic surgery is a highly specialised surgical technique for removal of skin cancer in which the Mohs trained dermatological surgeon immediately examines the excised skin under the microscope to ensure that the skin cancer is fully removed. 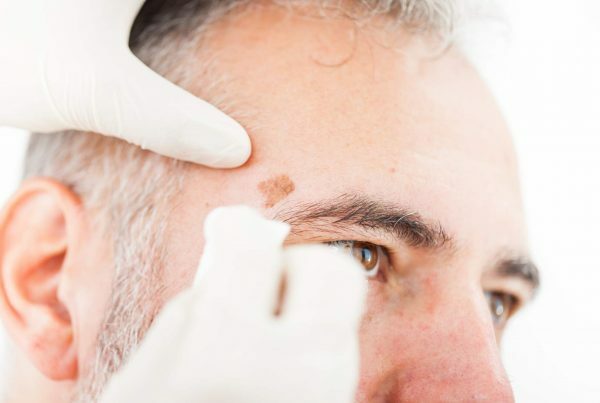 Mohs surgery has a very high cure rate and allows skin cancer to be removed very accurately whilst minimising damage to surrounding tissues and often reducing the size of the wound. Most high risk skin cancers skin cancers (e.g. 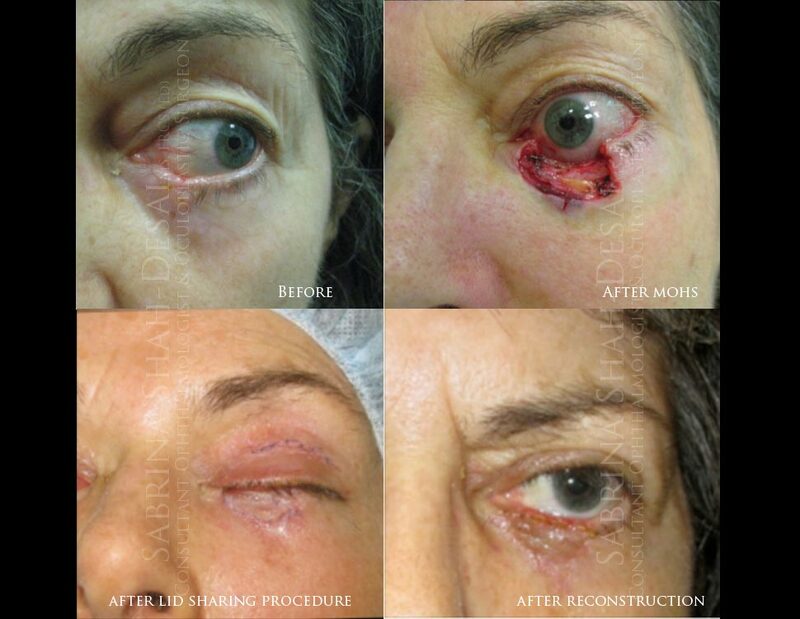 around the eyes) are treated using Mohs surgery. Mohs surgery tends to be selected for patients who have unusual or more difficult tumours because of their type, size, and location or because of the failure of other techniques to produce a cure. Warning: some of the pictures are graphic and may cause distress. Disclaimer: Your results may vary. Any specific claims or permanence length of results vary for each patient and are not guaranteed. Your procedure begins in the morning. The area around the skin is completely numbed using a local anaesthetic injection. This causes a stinging sensation for a few seconds after which you should feel no discomfort. After this, the affected area is scraped to define the size and remove the obvious cancer. Next the skin around the obvious cancer is removed with a scalpel. The doctor who then divides it into smaller specimens, which are prepared for examination, takes this tissue away. A map of the cancer site is made showing the position of the specimens, which are then examined under the microscope. During the preparation of the specimens for microscopic examination a dressing is applied and you will be able to walk to the waiting room to await the results (usually 1 to 1½ hours). The doctor studies the specimens for the presence of cancer at the edges. If there is still cancer present you will be asked to return to the operating room where any remaining area of cancer is cut out exactly as before. The process in repeated (sometimes several times) until no remaining cancer can be found. The doctor will assess the best options for closure of the wound and will discuss these with you before going ahead. In larger or more difficult cases, arrangement might be made for any of the following: referral to another specialist for reconstruction (either same day or a few days later), admission to hospital, or surgery requiring a general anaesthetic. 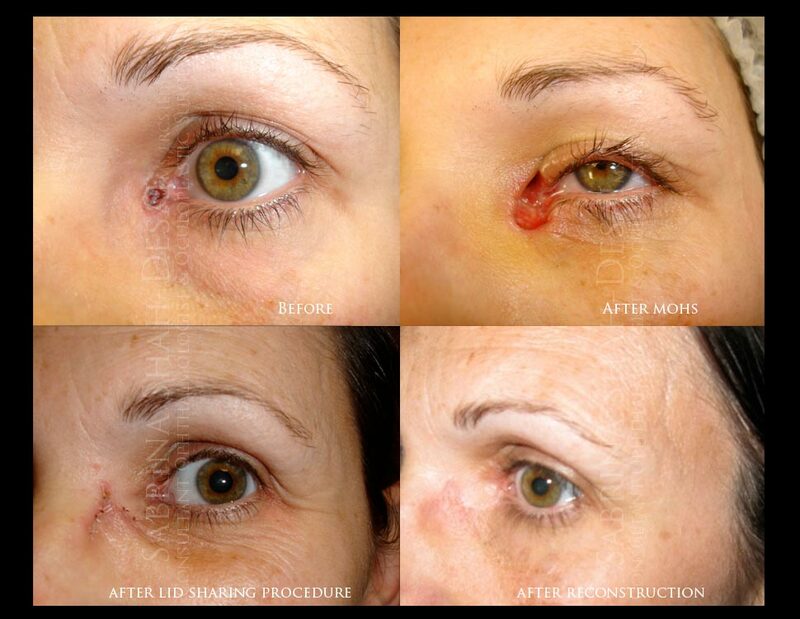 Once all the skin cancer is removed, the surgical defect is repaired. The wound will always be repaired to give you the best possible cosmetic result. What complications can occur in Mohs? Please avoid aspirin and other painkillers (diclofenac, Voltarol, ibuprofen, Nurofen, Brufen etc.) as this increase the chance of bleeding. Local wound infection can sometimes occur (less than 2-5% of patients) causing the area to become red, tender or weepy 2-5 days after surgery. This would usually be easily treated with a course of antibiotic tablets. Bruising is very common, especially for surgery of the upper part of the face, but will clear within a few days. Sometimes the wound can start to actively bleed several hours after surgery. If this occurs you should press over the area constantly and firmly for a full 15 minutes by the clock. This should be repeated if necessary. 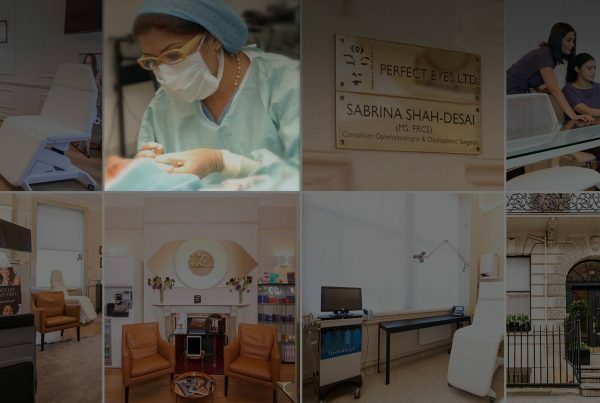 All surgical procedures leave scars, but every effort will be made to produce the best possible result, for example by disguising scars in natural skin lines. This is sometimes best achieved by actually increasing the length of the skin incision, so that the scar is longer than the size of the skin cancer. Occasionally damage to nerves in the skin can occur. This may leave you with an area of numbness over or adjacent to the wound. More rarely it may cause weakness to some of the facial muscles (e.g. on the forehead), which may improve with time or very occasionally may require a corrective procedure. What are the potential risks & complication of Mohs micrographic surgical correction? Minor bruising or swelling, which settles in 1-3 weeks can be expected. Bleeding and infection which are potential risks with any surgery, are very uncommon. Occasionally the eyelid may look a bit different, smaller or larger than before. If the skin cancer involves the tear drainage system, the eye may tear afterwards. These conditions can be treated by further surgery. Recurrence is rare but may occur even after complete excision of a skin cancer. Recurrence is much more common if the lesion is not completely excised.